Capcom vs. SNK Pro is a fighting game that was developed by Capcom and released in 2000. It is an upgrade to the original Capcom vs. SNK, which features characters from various Capcom and SNK franchises, most notably Street Fighter II and The King of Fighters. Pro attempted to create a better balance between the existing characters by improving upon (or toning down) the strengths and abilities that characters possessed in the first version. It introduce two new characters, Dan and Joe, and changed a few of the moves of the existing characters. In addition to the character and rule tweaks, Capcom vs. SNK Pro provided players with all of the characters that were initially locked away in the original version. Players who took the time to unlock every feature in the Dreamcast version of Capcom vs. SNK would not need to repeat their efforts the second time around. When Pro was converted for play on home consoles, it was ported to the Sega Dreamcast, but was only released in Japan. It was also ported to the PlayStation, where it saw a stateside release. See below for a summary of the changes from the first Capcom vs. SNK to Pro. For information on how characters have been changed, please refer to their individual character pages. 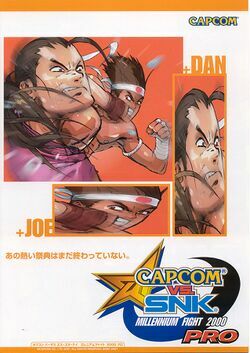 The inclusion of Dan and Joe as the "previous champions" of the original tournament. All secrets that were initially locked in the first game are unlocked immediately in Pro, such as run/dash, hidden backgrounds and EX characters, etc. A new turbo option has also been added to the options menu to allow you to adjust game speed. Since there is nothing else to unlock, the Secret mode from the first game has been removed. The Groove Point System has been changed. Using weak attacks will still get you D or C grade which lower your overall groove points. Using a special move or hard attack usually earns you either a B or an A grade, which slightly raises your groove points (A points occur when your special move hits the opponent as a counter when they are trying to attack you). S points occur when you successfully hit your opponent with a normal move, special move, or super at any point while your opponent is still in their super animation. If you finish a match with an S grade, you will be awarded a finest KO, which will substantially increase your GP. As a consequence, the only way to really get high groove points is to earn a lot of S grades. Life bar is now green for the entire match. Characters flash blue on a reversal instead of white. Capcom Groove's super bar fills when you successfully hit your opponent or block their attack. It no longer fills when you take damage. SNK Groove's super bar now has a slow startup. When you hold + to charge, it starts filling up slowly, then speeds up the longer you hold the buttons down. SNK Groove fills when you take damage but not when you block. Ratio 1's take more proportional damage when hit by higher ratio characters, and they inflict much less damage to higher ratio characters. Ratio 3 and 4 characters inflict more damage to ratio 2 characters and significantly more damage to ratio 1s (Some ratio 3 characters combos have the potential to instantly kill a ratio 1 character even if they are at full health). Most jumping and attacks end faster than before, and uppercuts in general have less priority as anti-air attacks. Glitches from the first game appear fixed: Only 1 chunk of super bar is awarded for an entire multi-hit throw, so the Capcom multi-hit throw glitch is fixed. Corner juggles perform differently with juggles off of special moves or supers now. Juggling will often miss unless you execute a Super Combo very early while your opponent is still high in the sky. Taunting your opponent adds to their super meter a little bit. This can be useful against people who like leaving their SNK bar almost charged. You can taunt and force the bar to MAX out and begin draining. Computer AI has been improved in 1 player modes. The computer will perform a lot of delayed get-ups now and is much more adept at fighting against players in general. Unfortunately, it will occasionally do some fairly impossible things, such as three Blanka balls in a row without landing. It's easier to bring down the support beams in the stage with Takuma and Duck King in the background. There are now two places where shadows appear in the outside night club stage. The crowd in the shopping district has more animation. Many new post-match win quotes, characters will address other defeated opponents specifically. Also, multiple members of your team sometimes taunt at once instead of just the first character all the time. The addition of many subtle frames of animation added to each characters. King kicks her hat at a lower angle than in the first CVS during her intro at the start of the match. When you select a character they taunt instead of saying their names. Balrog has a new win pose where the snake tattoo on his body comes alive and extends. It can also be seen in Capcom vs. SNK 2. The endings have been changed. Now each character you pick on your team is interviewed and gets to give their own quote during the ending sequence (the previous screen that showed Dan and Joe winning the tournament has been replaced with this). (Dreamcast) A link mode was added ("Color Convert") that allows you to import your custom colors from CVS, or you can use the "Secret Data" option to create a save file for CVS with all the secrets unlocked (These options only work with the Japanese version of CVS, they will not work with the American version). This page was last edited on 17 December 2015, at 08:20.